If you're not already a member, why not join ALPCA today? As far as I can remember, the first time Illinois collectors ever got together was in someone's backyard in Oak Brook in 1963. Then in the mid1960's, we had several meets at Russell Poole's place in Polo. Howard Rasmussen of St. Charles sponsored several meets and all the while we were calling our informal organization various names. 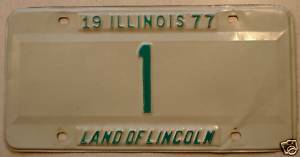 One was ILPCA (Illinois Plate Collectors Association), another incorporated the letters LOL (Land of Lincoln). In 1970 we hosted the ALPCA convention in St. Charles. More than 100 collectors came which was a record at that time. In 1972 we came up with the name MAPA and started sending in reports on our meets to the ALPCA newsletter. It looked like we were finally underway but by 1974, for reasons I can't remember, MAPA slumped. We continued to have meets but they were small. Art Currie of Salem Il got things going again and by 1977 we had another national meet in Illinois. Well, we've been going strong ever since then and thanks to Tom Baur, Rose and Daryl Williams, Joey Hurd and some others for picking up the pieces and getting formally organized.